Exclusive: In the early months of the Syrian civil war, the West’s mainstream media presented the conflict as a simple case of good-guy protesters vs. bad-guy government, but the conflict was more complicated than that and the one-sided version only made matters worse, writes Jonathan Marshall. Since the Syrian civil war began in 2011, nearly a quarter million people have perished and fully half of the country’s inhabitants have been forced from their homes, creating the worst refugee crisis in the past quarter century. Meanwhile, the continuing advance of brutal Islamist factions, which a leading CIA officer in 2013 termed the “top current threat to U.S. national security”, makes the chances of restoring peace and human rights seem more remote than ever. Many parties are to blame, but certainly among them are interventionists in the United States and its allies who rationalized supporting the Islamist opposition, and refusing to embrace serious peace negotiations, on the grounds that Syrian President Bashar al-Assad is a uniquely evil dictator. That image of Assad grew directly out of his regime’s brutal response to civilian protests that began in early 2011, soon after the start of the Arab Spring. But the convention wisdom, that “the protest movement in Syria was overwhelmingly peaceful until September 2011”, is wrong, or at best incomplete. In fact, opposition to the government had turned violent almost from the start, and was likely aimed at provoking a harsh reaction to polarize the country. Although nothing justifies the myriad crimes committed by state forces then and since, facts ignored by most media and government accounts suggest that responsibility for the horrors in Syria is widely shared. The facts undercut the rationale behind inflexible demands for “regime change” from Western and Gulf leaders that closed the door on serious negotiations and opened the way to mass slaughter and the rise of today’s Islamist-dominated opposition. Matters went from bad to worse when demonstrators fought back. As one Israeli journalist reported, “In an uncharacteristic gesture intended to ease tensions the government offered to release the detained students, but seven police officers were killed, and the Baath Party Headquarters and courthouse were torched, in renewed violence.” Around the beginning of April, according to another account, gunmen set a sophisticated ambush, killing perhaps two dozen government troops headed for Dara’a. President Assad tried to calm the situation by sending senior government officials with family roots in the city to emphasize his personal commitment to prosecute those responsible for shooting protesters. He fired the provincial governor and a general in the political security force for their role. The government also released the children whose arrest had triggered the protests in the first place. 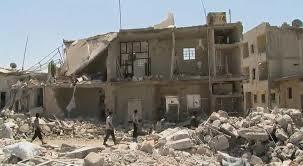 The Assad regime reacted ruthlessly, laying siege to the town with tanks and soldiers. Security forces cut water, electricity and phone lines, and posted snipers on rooftops, according to residents quoted by The New York Times. At the same time however, according to another report, unknown gunmen in Dara’a killed 19 Syrian soldiers. Meanwhile, protests had begun spreading to other towns, fed by social media campaigns. By late April, government forces had reportedly killed several hundred protesters. Dozens of their own were killed as well. In early April, for example, nine Syrian soldiers on their way to quell demonstrations in Banyas were ambushed and gunned down on the highway outside of town. Western news media suggested they were killed by Syrian security forces for refusing to fire on demonstrators,a fanciful tale that was analyzed and demolished by Professor Joshua Landis, director of the Center for Middle East Studies at the University of Oklahoma. An opposition leader based in Paris, who urged local demonstrators to remain non-violent, told Landis that he had been approached by three groups “to provide money and weapons to the rebels in Syria.” They included “several pro-American Syrian opposers” whom he refused to name. He declared that anyone providing money and weapons to the rebels was “pushing them to commit suicide,” a prescient warning. He also accused the Western press of similarly misreporting a massacre of government security forces in early June, 2011, in the city of Jeser al-Shagour, a Muslim Brotherhood stronghold near the Turkish border, where some 140 members of the police and security forces were slaughtered. Several Western news accounts uncritically recited claims from local activists that the victims had mutinied against their commanders and been killed by government forces. But video footage of the fighting was “fairly conclusive in corroborating the original government version of events: the soldiers stationed in the town were overrun by armed and organized opposition,” Landis noted. “Syria’s divisions are too deep. The fear of revenge and ethnic cleansing will galvanize those who have backed the present order for decades. Had the Syrian leadership been willing to hand over power peacefully or establish some sort of constitutional convention, it would have done so already. The poverty and loss of dignity for so many Syrians is a crushing part of Syrian reality. . . .
“Americans should be concerned about what is happening in Syria, if only because it threatens to become another undeclared war like Libya but much, much worse. . . . NATO is already clandestinely engaged in the Syrian conflict, with Turkey taking the lead as U.S. proxy. . . . Unmarked NATO warplanes are arriving at Turkish military bases close to Iskenderum on the Syrian border, delivering weapons from the late Muammar Gaddafi’s arsenals as well as volunteers from the Libyan Transitional National Council who are experienced in pitting local volunteers against trained soldiers, a skill they acquired confronting Gaddafi’s army. However, the deadly provocations against Syrian government forces put an entirely different cast on the origins of the conflict. Furthermore, some human rights organizations also acknowledge that armed opposition forces began committing crimes against civilians by the summer of 2011. In March 2012, Human Rights Watch sent an “open letter” to leaders of the Syrian opposition, decrying “crimes and other abuses committed by armed opposition elements,” including the kidnapping and detention of government supporters, the use of torture and the execution of security force members and civilians, and sectarian attacks against Shias and Alawites. In choosing to cite human rights selectively as their rationale for regime change, Western governments, including the Obama administration, followed longstanding double standards. Many of the U.S-backed states involved in the anti-Assad campaign, including Saudi Arabia and Israel, have also committed gross human rights violations and war crimes, whether at home or in neighboring territories and states such as Gaza, Yemen and Lebanon. History shows that war itself is the greatest threat of all to human rights. Surely our common “responsibility to protect” should start with efforts to limit the start and expansion of armed conflicts, not to inflame them in humanity’s name.